Kelso's Gregor Mein charges at the Kirkcaldy defence (picture by Gavin Horsburgh). The game earlier in the season resulted in a resounding win for Kirkcaldy by 41-14, reports Norman Anderson. But, since then, there’s no doubt Kelso are a much-improved side, having moved from the bottom of the league to eighth in the space of a few weeks, after four bonus-point winning games. They know, however, it’s important to win against the teams around them in the league. After 10 minutes, this was not looking likely for Kelso as, firstly, they lost Charlie Marshall in the space of 30 seconds from kick off and, secondly, they shipped an easy try after only six minutes, when Michael Harper was driven over, following a line out near the Kelso line. Finlay Smith converted to take the Fifers seven points clear. After 17 minutes, Kelso transgressed and conceded a kickable penalty, which Smith slotted. It was 20 minutes before Kelso were awarded their first penalty and, following that, they got a toehold on the game. Murray Hastie kicked a penalty on 25 minutes, after the visitors’ backs had been caught offside. There followed a bad tackle on Phil Hume after a line out. The challenge was late, high and with no arms but, surprisingly to the Poynder Park faithful, it was a penalty only. Kelso continued to exert pressure and it was rewarded when Gregor Mein broke through up to the posts, where Kirkcaldy centre, Josh Laird, tried to slow down the ball but it was quickly recycled and moved out to replacement Kevin Dryden, who crashed over. Between the try and the conversion, Laird was invited to take a break, as he was yellow-carded. Hastie converted to bring the game level. Kirkcaldy’s Owen Bonner was next to be binned and, during that time, Kelso increased the lead with a driven maul from a line out, with Blair Robertson getting the touchdown. The Lang Toun side had a chance to reduce the leeway with a 40-metre penalty but it was ill-directed, leaving Kelso ahead by 15-10 at the interval. Kirkcaldy made the better start in the second half but Kelso weathered the storm and moved up a gear to gain control of the match. The Kelso coach was asking for an increase in tempo to the hosts’ game, and that was exactly what he got. The only reason Kelso did not increase the lead was because of indiscretions, mainly in handling, although they were pinged at scrum time for an early engagement. Their continuity play and support was encouragingly good and, at times, they were in full rampage mode by playing a game which was just too fast for the tiring visiting forwards. Good hassling by Angus Roberts and a crunching tackle by Kevin Wilson took the play into the Kirkcaldy danger area but the try was just not coming. The Kirkcaldy defence was exemplary under extreme pressure. They were conceding penalties so much so that they lost Struan Robertson, who took one for the team after all the misdemeanours. 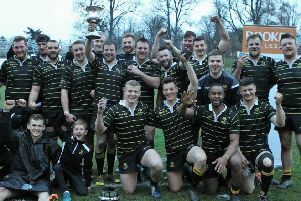 The Kelso scrum was now dominating affairs and they opted for a succession of scrums from penalties until just on full time, a Kris Mein pick-up was rewarded when Michael Downer crashed over, for Murray Hastie to convert and take Kelso to a 22-10 win.